Named after a local Indian chief, who probably never downhilled in his life, Mt. McSauba Recreation Area dates back to 1956 when 10 fathers approached city officials about starting a ski club to give children something to do in the winter. The city donated a steep dune on the north side of town, the fathers each tossed $100 into a kitty to purchase equipment and locals pitched dirt that summer to increase the height of their new ski hill. When the first snow arrived somebody backed up a Ford Model T, deflated a rear tire, rigged a tow rope off it and pulled the first skiers up the slopes. They've been skiing at Mt. McSauba ever since, making it one of the oldest downhill areas in the state. Locals like to call their community hill “Little Nub’s Nob.” The Harbor Springs ski resort, one of the most popular in the Lower Peninsula, has taken Mt. 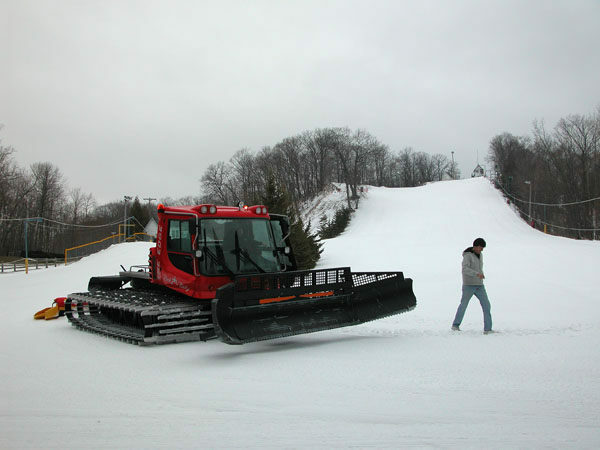 McSauba under its wing by providing a groomer and snowmaking equipment at no cost to the city of Charlevoix. Serviced by four tow ropes, most of Mt. McSauba’s six runs are on the front facing the day lodge but on the backside is Tornado Alley, so named because it catches the wind blowing off Lake Michigan. At the top of the Alley you enjoy a panorama of the lake and the frozen shoreline and then can tackle the Mt. McSauba’s longest run, a 1,100-foot-long intermediate slope with a vertical drop of 150 feet. More than just a ski slope, Mt. McSauba is a true winter recreation area. There is a skating rink with a warming cabin on the south side, a lighted sledding hill on the north side and behind the towering dune a cross-country ski trail. The loop is less than a mile but it is equipped with lights that go on automatically from 5-11 p.m. for night skiing. It begins in the parking lot for the sled hill where the lights lead you into the woods. Within a half mile you pop out at the base of Tornado Alley before looping back to the trailhead. 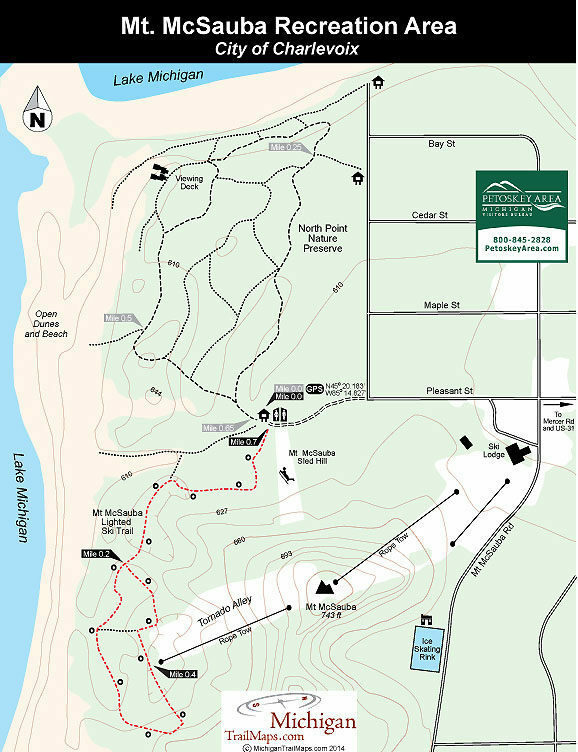 If more mileage is needed, it’s easy to continue into the adjacent North Point Nature Preserve for another easy loop of 0.6 miles. The McSauba loop is occasionally packed while the North Point trails are skier-set and also used by snowshoers. 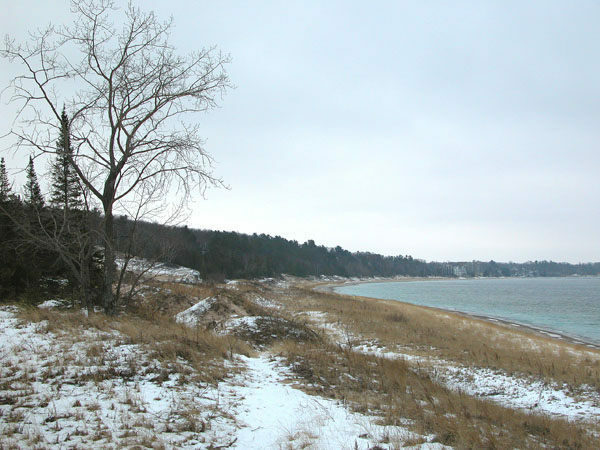 Both provide access to the Lake Michigan shoreline for an unusual winter scene. Mt. McSauba Recreation Area offers downhill skiing with tow ropes, rental equipment, lessons and a lodge. There are also cross-country ski trails, a skating rink and a sledding hill. The Mt. McSauba ski trail is loop is lit from 5-11 p.m. daily for night skiing. There is no fee for Nordic skiing at the recreation area. The recreation area is a mile north of downtown Charlevoix. From US-31, turn west on Mercer Boulevard and in less than a mile south on Pleasant Road. Call the Mt. McSauba lodge at (231) 547-3267 or contact the Charlevoix Parks and Recreation Department at (231) 547-3253.